when an electrical discharge is passed through a sample of hydrogen gas at low pressure, a pinkish glow is observed. 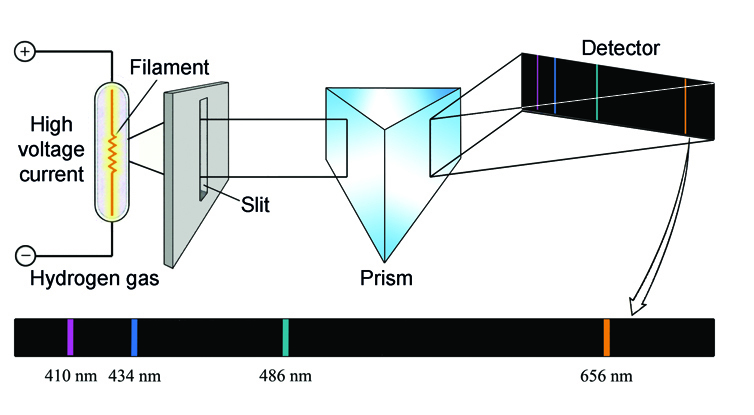 This glow can be examined using a simple spectroscope. A number of separate lines can be observed. It is important to realize that each line in the spectrum corresponds to an electron’s changing from one energy level to another. where E2 is the final energy level, E1 is the first energy level, h is a constant, and ν is the frequency of the radiation.